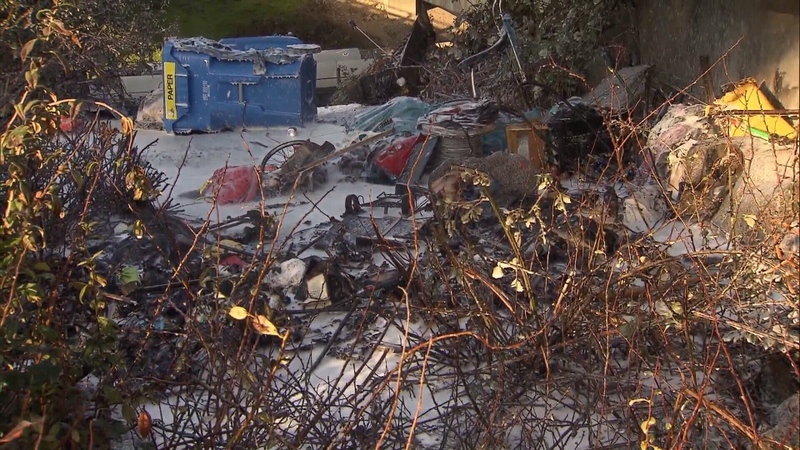 A blaze broke out at an East Vancouver homeless camp Wednesday morning, and firefighters warn there could be more as temperatures continue to drop. Flames tore through a number of tents and tarps set up between the Dunsmuir and Georgia viaducts on Main Street, the same location where another fire was sparked less than a month ago. Crews managed to douse the flames, and there don't appear to be any injuries – although there was no one at the scene when firefighters arrived. Capt. Jonathan Gormick said people living outside often do whatever they can to keep warm, even putting heaters inside tents – something he cautioned is never safe. "We've seen fatalities, especially in the Lower Mainland when fire has spread to synthetic materials like tarps and tents and it traps people and burns them severely," he said. The colder it gets outside, the more likely it is to happen, Gormick added. He encouraged people to instead stay warm by layering up with clothes and blankets, or getting in touch with a homeless outreach worker. Tents, tarps, clothes and some electronics were destroyed in a fire Wednesday morning in East Vancouver.